The church organ hasn’t always been a part of organized religion. Originally the organ was the center of all culturally significant events such as banquets, games, and celebrations. The organ only made its way into the church 1100 years after the organ came to be. 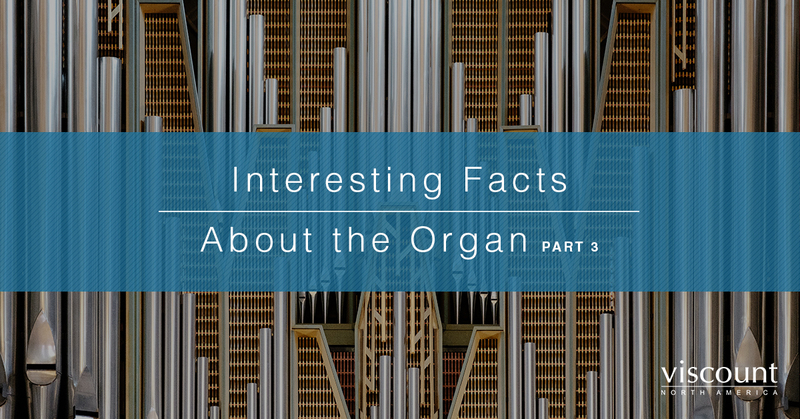 History shows that the organ in its earliest forms may have been in existence around 250 BCE. The fact that the organ has survived thousands of years and is still a cherished musical instrument is a testament to the organ’s popularity and transcendence. Viscount has been crafting exquisite church organs and engineering digital organs with multi-dimensional sound capabilities for many years and are pleased to offer the world the highest quality organs. Learn more about Viscount organs and find a dealer on our website! Or keep reading below to learn more interesting facts about organs! In 1524, the organ was one of the instruments that was taught at the first music school in Mexico. Spanish missionaries established this school and soon the native people were building organs themselves. In 1735, the Cathedral in Mexico City wanted a second instrument and they hired Jose Nassarre, a native Mexican to build their organ. Pepe the Short, King of Franks wasn’t the only one to receive an organ as a gift. In 1599 Queen Elizabeth of England gifted the Sultan of Turkey with a self-playing organ. Queen Elizabeth, as many monarchs before her, loved the organ and encouraged composers such as Byrd, Bull, and Gibbons to include the organ in their compositions. Despite the organ’s popularity throughout history, apparently, it was not a popular instrument with the Puritans in England. During the 1640s and beyond the Puritan movement under Oliver Cromwell destroyed organs and other works of art in English churches: to the Puritans, the organ and related music did not reflect their austere beliefs. The battle of the organs originated as a battle for the commissioning of building the organ for London’s Temple Church. Henry Purcell and a man known as Smith played the organ against each other and it was decided afterward that Smith would build this much-anticipated organ. Paul Revere did not own an organ, but he was the sexton at the Old North Church. The organ of this church, built by Thomas Johnson in 1759 soon became famous due to Revere’s ride and has been enlarged several times and restored by David Moore. To learn more about the organ continue reading our blog and if you are interested in finding your own church organ be sure to visit our website to learn more about our quality crafted organs and to find a dealer near you.